It’s time for hot dogs, fireworks, swimwear and lots of fun in the sun! The sun may be your main source of Vitamin D, but don’t forget the damage it can do to your skin. And because I’m not shy about playing favorites, here’s a brand new product I can’t (and won’t stop) talking about. 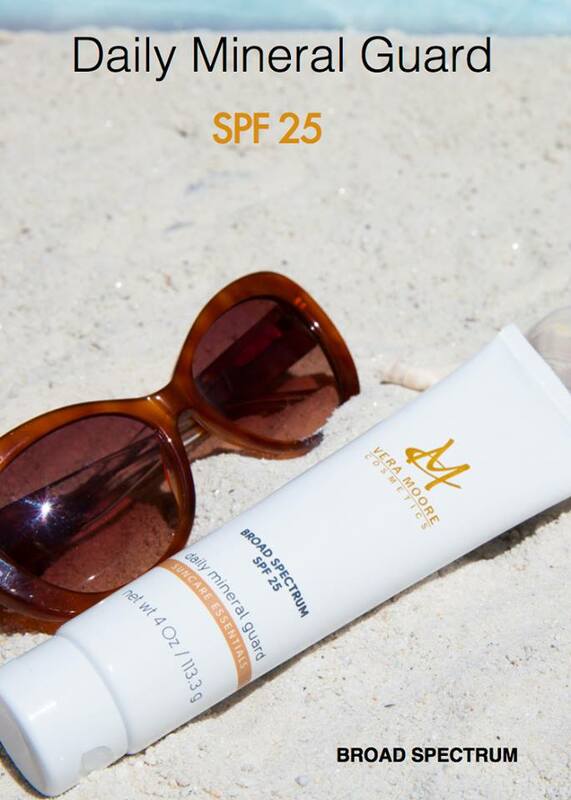 Enter the new Vera Moore Broad Spectrum Sunscreen SPF 25.The sun’s UV rays break down the collagen of the skin resulting in loss of elasticity. And regardless of the forecast, UV rays are present all year round. Yes, even on cloudy days. So, if you haven’t yet gotten in the habit of wearing sunscreen daily, you might want to start while under the hot summer sun. Yes, you too my brown-skinned sisters! Your fair skin counterparts may be more likely to develop skin cancer, but you’re at risk for more serious cancers.Broad spectrum sunscreen is fundamental for defending the skin from harmful sunrays. And, while a tan may be cool, is it worth it? Even though the SPF number is merely an indicator of how long you can stay in the sun before burning, it does not indicate how much protection you get. Dermatologists usually recommend at least an SPF of 25 or 30. However, not all sunscreens are equally effective! You definitely want to get on board with a “broad spectrum” SPF – which protects you from both the UVA and UVB rays.This is why I’m making Vera Moore Broad Spectrum Sunscreen SPF 25 daily mineral guard one of my daily suncare essentials. Apply 15 minutes before sun exposure, then reapply every two hours thereafter. I love that it’s paraben free, and unlike some of it’s competitors, does not leave my skin oily. The Vera Moore Broad Spectrum Sunscreen completely disappears into your skin leaving nothing but smoothness. Disclosure: Vera Moore Cosmetics is a family owned business, birthed by Vera Moore - a soap opera actress turned beauty icon, and a client of mine.